We recommend checking out our discussion threads on the ALFRED DVD: Pro Tools 10: Course Clips 54-1133732569, which address similar problems with connecting and setting up Audio Software Tutorials ALFRED. 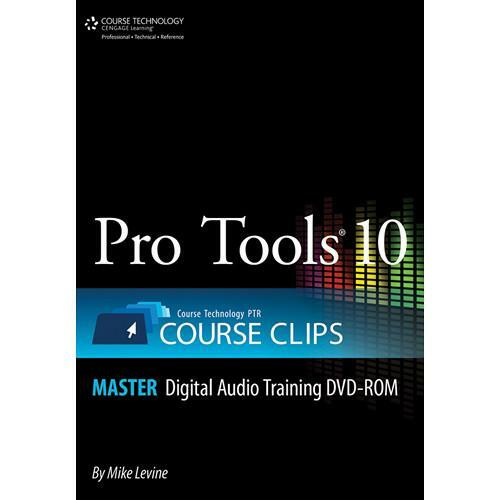 The user manual for the ALFRED DVD: Pro Tools 10: Course Clips 54-1133732569 provides necessary instructions for the proper use of the product Pro Audio - Audio Books & Tutorials - Audio Software Tutorials. Pro Tools 10: Course Clips from Alfred teaches you the ins and outs of Pro Tools 10, the latest version of the world's most popular digital audio workstation, with Pro Tools 10: Course Clips. Featuring more than five hours of step-by-step, hands-on video tutorials, this DVD is proof positive that learning can be both easy and fun. Watch over the shoulder of a Pro Tools expert, and listen and learn as he walks you through the features and functions of the latest version of this popular, creative software. First you'll check out the features new to version 10, then you'll dive in and learn about the workspace browser, recording, editing, instrument tracks, using plug-ins, Beat Detective, mixing, exporting, and much more. If you own a ALFRED audio software tutorials and have a user manual in electronic form, you can upload it to this website using the link on the right side of the screen. The user manual for the ALFRED DVD: Pro Tools 10: Course Clips 54-1133732569 can be downloaded in .pdf format if it did not come with your new audio software tutorials, although the seller is required to supply one. It is also quite common that customers throw out the user manual with the box, or put the CD away somewhere and then can’t find it. That’s why we and other ALFRED users keep a unique electronic library for ALFRED audio software tutorialss, where you can use our link to download the user manual for the ALFRED DVD: Pro Tools 10: Course Clips 54-1133732569. The user manual lists all of the functions of the ALFRED DVD: Pro Tools 10: Course Clips 54-1133732569, all the basic and advanced features and tells you how to use the audio software tutorials. The manual also provides troubleshooting for common problems. Even greater detail is provided by the service manual, which is not typically shipped with the product, but which can often be downloaded from ALFRED service. If you want to help expand our database, you can upload a link to this website to download a user manual or service manual, ideally in .pdf format. These pages are created by you – users of the ALFRED DVD: Pro Tools 10: Course Clips 54-1133732569. User manuals are also available on the ALFRED website under Pro Audio - Audio Books & Tutorials - Audio Software Tutorials.